We highly recommend scheduling an appointment via our online system to guarantee service. We have additional Barbers at our second location, Monocle Barbers (located across the street). Please scroll down for info on our second location! We are located just off the 405 in Westchester. Before your service, please feel free to help yourself to Drinks, WiFi, Phone Chargers, & the Massage Chair! The duration of most services is APproximately 30 minutes. This service begins with a brief consultation, where we carefully listen to the customer' desired hairstyle in accordance with their lifestyle. This is followed by a quality haircut using state-of-the-art clippers & the finest Japanese scissors (including texturizing shears). Master Barbers will then demonstrate the recommended product application from an assortment of popular and natural hair products to achieve the customer's desired hairstyle. This service begins with a brief consultation followed by a haircut using *only* fine Japanese scissors (including texturizing shears). An optional pomade/paste application is provided. Master Barbers will demonstrate the recommended product application from an assortment of popular and natural hair products to achieve the customer's desired hairstyle. Get ready for the compliments after experiencing our distinguished & lasting premium skin fade service. Master Barbers utilizes the finest tools on the market to give you the closest, most well-rendered fade. This service begins with a relaxing hot towel application to open up the pores for a smoother, more comfortable shave. This is followed by hot lather, then a gentle, straight-edge razor head shave, ending with an optional cold towel service to close the pores. The services culminates in the application of our finest aftershave balm to replenish & protect the skin. For the time in between regular visits, a good clean up around the ears and neck lines helps maintain grooming. We utilize clippers and/or a straight razor around the edges, followed by hair product application for hairstyle. For the individual that needs to unwind or simply relax, try our exclusive scalp massage. Utilizing a combination of scalp oils and aroma therapy, we apply circular movement on pressure point areas, including the scalp and behind the neck. This service begins with a hot towel/s service to the face to soften the beard, followed by rich hot lather, then a gentle, straight-edge razor face shave, ending with a hot or cold towel service to close the pores. It finishes with an aftershave balm application to replenish and protect the skin. // This service is now available on our massage chair for an added experience! Utilizing clippers, a fine comb, & scissor instruments, the beard is groomed to the customer's desired length, thickness, & overall symmetrical shape. A groomed bear complements well with our 'Regular Clean Up & Style' service, where we cleanup the ear and neck lines using clippers. After the beard is shaped accordingly, Master Barbers applies hot towels, then a rich, warm lather to the face & neck to prepare for precise detailing. The barber then proceeds to detail using a straight-edge razor, after which a hot or cold towel service is provided to close the pores. The service finishes with an after-shave balm application to replenish & protect the skin. This service consists of two hot towel preps & the application of facial clay, which removes the oils & toxins from the skin, leaving your skin feeling revitalized. This service begins with a hot wax application to the nostrils & ears, which is then left to dry, proceeded by rapid removal of hair for long-lasting results. We highly advise scheduling these services in advance, during one of our available 60 minute time slots. For special occasions, sometimes you need service in a pinch. Please contact (424) 393-4014 to inquire about before or after hour & same-day services. Please contact us in advance to schedule a date & time for a Master Barber to come to directly to you. Prices may vary in accordance with services provided & distance traveled. Please contact us in advance to schedule a date & time for you & your groomsmen to get pampered with our signature services. GIFT CERTIFICATES AVAILABLE IN-STORE UPON REQUEST! Master Barbers was established in April 2016 by Israel & Anna Castro in Los Angeles, California. The two station, full-service barbershop has now grown to become a brand, by providing precision (detail) services and exceptional customer service. Services include haircuts of all types, from ages 1 and beyond. From gentlemen's scissor haircuts to modern premium skin fades to straight edge razor shave services, Master Barbers offers its supreme expertise. We also offer an assortment of organic and natural men's hair and shave products. The name "Master Barbers" is the brainchild of Master Barber's very own Israel Castro, honoring his time as a Master Barber at a previous barber spa in Beverly Hills, California. After mastering the trade, Israel and Anna worked together to open this family-owned neighborhood barbershop with affordable prices. In February 2018, the couple then expanded their footprint to include a second location, "Monocle Barbers" (located just across the street). Between the two locations, the Master Barbers family has grown to include 5 highly skilled barbers. Born in Mexico City, Israel came to the United States at the age of six. He began cutting his own hair in high school and continued on through his college days. For over ten years, Israel has been a family and community barber. He received his barber license from the California Board of Barbering and Cosmetology. Starting out from humble beginnings in his garage, to neighborhood barbershops, to cutting in fine men's barber spas in Beverly Hills, Israel has worked to continually hone and develop his craft throughout his career. As the owner & operator of two barbershop locations in Los Angeles, California, his mission is to continually provide exceptional barbering services and sharpen the next line of future Master Barbers. Hailing from Los Angeles, Lloyd has been providing haircuts to his friends and family members since his high school days. He began cutting his own hair, then became a neighborhood barber in Westchester, California. His goal is to one day provide mobile barbering services to all of Los Angeles. Lloyd has 12+ years of barber experience and received his license from the California Board of Barbering and Cosmetology. Adrian has been cutting hair in the Los Angeles area for well over a decade, and has earned a reputation as one of the premier barbers coming out of Santa Monica, California. Like any good neighborhood barber, Adrian has come from humble beginnings. He started out by cutting hair at home for his friends and family — coincidentally, the people with whom he likes to watch baseball and spend quality time. 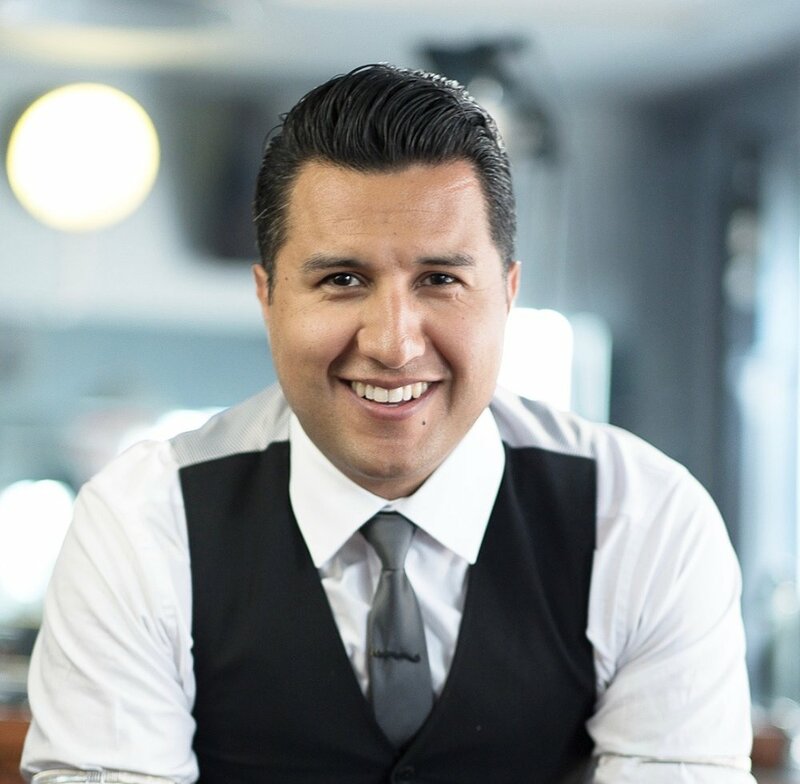 Adrian has 15+ years of barber experience and received his license from the California Board of Barbering and Cosmetology. Click here to go to MonocleBarbers.com! "No doubt, Israel is the best cut in town. Your search for a barber has ended." "I can honestly say that this is one of the best haircuts I've ever gotten! Israel is the real deal. He is detailed, precise, and a true professional!" "Israel is a master at his craft and he does phenomenal work. There's nothing else to it." Click the button below to follow Master Barbers on Instagram! Stay up to date with any promotions we may be having, and get frequent tips on self-care and men's hair and shave products. We accept all major credit cards & Apple Pay!